Last Saturday mum, Ben and I jumped into my new car to give it a run to Oxford, destination Bicester Village. As usual I thought it only fair to give you a peak into my shopping bags and show you what I managed to pick up on this trip. 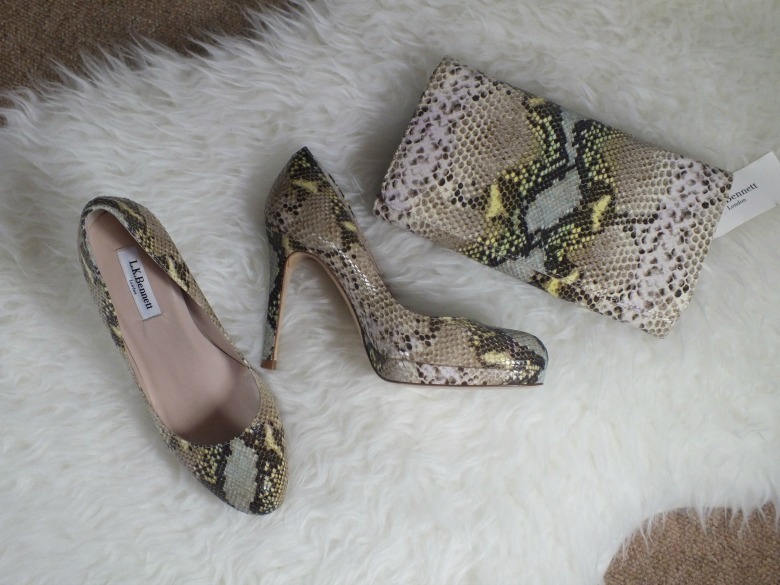 First up we have this gorgeous pair of snakeskin shoes and matching bag from LK Bennett which I plan to wear to a wedding at the weekend with this dress from Warehouse. The shoes felt surprisingly comfortable when I was trying them on in store so we know what that means don't we ladies? Yes that they'll be the most uncomfortable shoes on the night! The shoes were £125 and whilst I don't know the exact original price the sledge style from LK Bennett typically retails around £195 so approx 35% off. The matching bag was £110 from £225 so just over 50% discount. The black Leah sandals from LK Bennett were not needed, were purchased for no reason other than I loved them and refused to leave the store without them. On the bright side these were a whopping 73% reduced in the sale at £75 from an original price of £275. 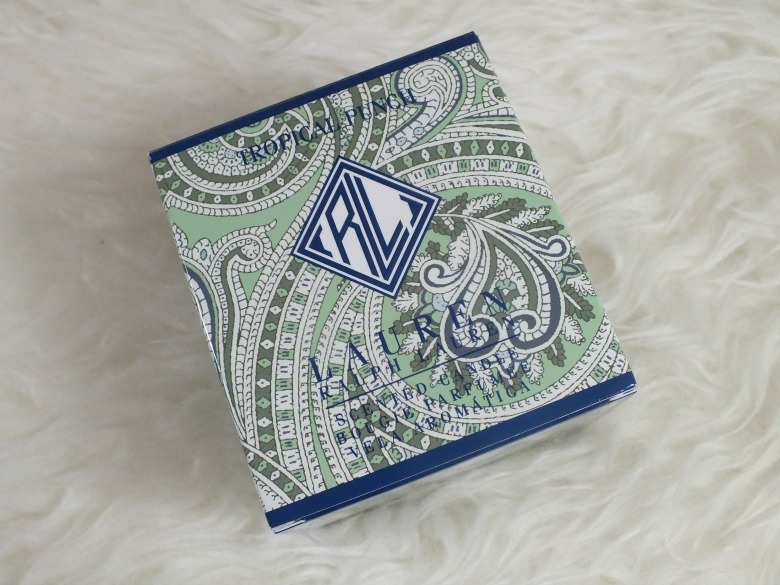 They looked fabulous with jeans and I can't wait to give them a whirl over the Summer. In addition to it's regular stores Bicester Village often has pop shops, last visit it was Cowshed and the space has now been taken over by jewellers Carat. I didn't have plans to even look in the store but it was right next to where we were sitting enjoying an ice cream and as I'd managed to devour mine quicker than everyone else I popped in for a look and one of those fabulous serendipitous moments happened. 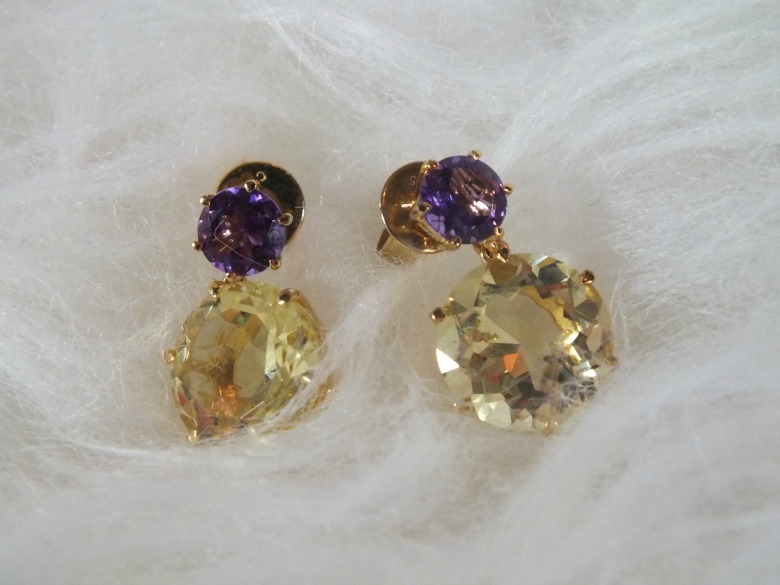 Carat is a fashion jewellers who use their own created gemstones to design jewellery that can be worn without bodyguards flanking you - and you can afford, that said these earrings would have originally set you back £94 but I managed to buy them for £37 - 60% off. They will add the perfect bit of of bling to my yellow ensemble at the weekend. I have to give credit to Ben for finding them and suggesting how perfect the amethyst stone would be to compliment the ring I have and can wear with it. One shop I was keen to visit on my trip was Kate Spade and yes, whilst I know I'll be in the States in less than a month where Kate Spade is more affordable I couldn't help buying this gorgeous mint green wallet for the trip. Ben rolled his eyes at my explanation for my 'needing' it but mum completely understood so I'm sure you will too. American's use more notes than we do in the UK, therefore our purchases don't always lend themselves well to the crossover. On many of my trips to the US I've been fumbling around in stores as I pull out my roll of dollar bills just to find $2 for a can of drink (or soda should I say!). This purse is perfect to store the notes in for easy access as well as the handy slots for hotel keycards, all important credit cards and my driving licence which comes in handy when asked for id in store. I can't wait to use it - and it still has a zipped area on the size for the odd coin that comes my way. 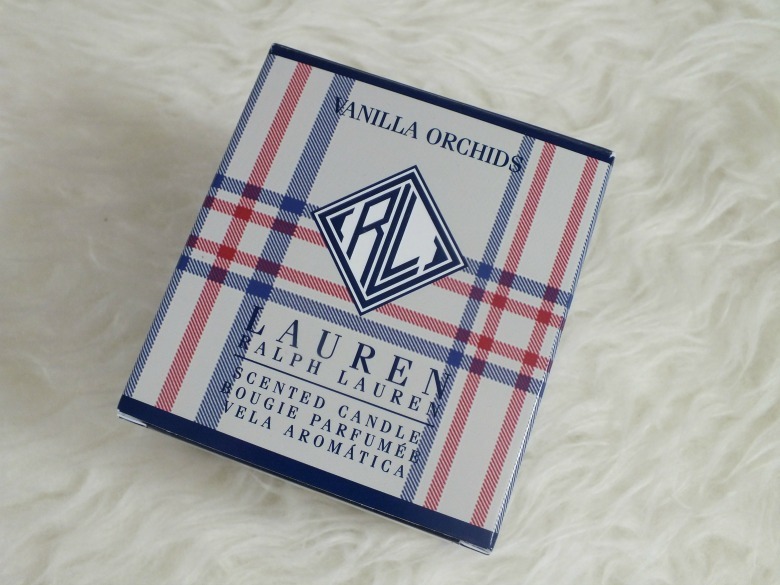 My final purchases were from Ralph Lauren home in the form of two lovely smelling candles at £12.99 which again was a discounted, discounted price at 56% discount. Oh and the Reiss bag, that was a very unexciting white t-shirt for £23, original price £35 - a great quality tee that I wore yesterday but we all know what they look like. Phew, that took some mathematical skills working out all those percentages, Carol Vorderman I am not. Are you an outlet shopper or do the prices still put you off? 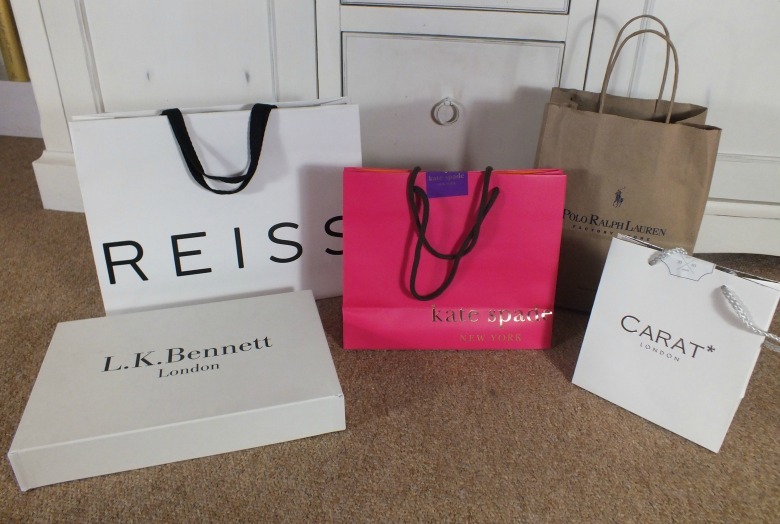 And if you'd like to hear more about Bicester Village I'll have a review up for tomorrow. I love all!!!! This was a good haul dear!! Thank you - I didn't do bad did I! If I had to pick a favourite, and I'd have to be pushed, I think the Kate Spade wallet, because it's in what me 'n' Arth call "that colour"! Can't wait to see you all dressed up in your wedding outfit! ooh, I love! I know about Carat, and really want one of their rings. Their stuff is gorgeous. umm. just one ickle point though. Aren't you on a 'no spend' thing before your hols? I was really impressed, they had some amazing stuff in there! Oh my wow! You have a Candy Pop turquoise wallet. Good work! If only my bank manager was as complimentary on it! OMG! The shoes (both pairs) are to die for! You are going to look fab for the wedding - can't wait for the pics!